Squamous Cell Carcinomas or SCC's are cancers of the flat scale cells that make up the outer layer of the skin (squamous cells). SCC's most commonly occur in areas that have been exposed to strong sunlight for many years. Usually the surrounding area shows chronic sun damage - scaly, red, wrinkled skin. SCC's are thought to arise from solar keratoses or sunspots. Another important risk factor is chronic immune suppresion, seen in transplant patients and people who take medications such as cortisone. 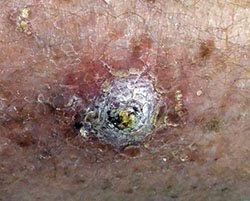 SCC's that haven't yet penetrated into the deeper layers of the skin (the dermis) are called in-situ SCC's or intraepidermal carcinomas. An old term for in-situ SCC's is Bowen's disease. In-situ SCC's are usually flat, scaly, pink or red, and tender patches, and they tend to bleed easily. Invasive SCC's are often thick scaly lesions. They are also often inflamed and painful, and are often fast growing. They bleed easily and can be ulcerated in the center. The best treatment option is usually excision. Small lesions in low risk sites (away from the head and neck) can sometimes be treated with curettage and cryotherapy. SCC's usually don't cause further problems once they are removed. However, they can spread or metastasize to local lymph nodes and beyond. This spread tends to occur later than what is seen in melanomas. They are especially prone to spreading from certain high risk sites e.g. lips and ears. Fig 1. SCC showing hyperkeratosis and inflammation.